I am delighted to say that I will be speaking at the GSMA Mobile 360 event on “Privacy & Security” in The Hague at the end of May. I’ll be speaking in Keynote Session 2 “Architecting for Data, Privacy and Cybersecurity” and I’ll be talking about how “the blockchain” (by which I mean the family of shared ledger technologies and related cryptographic techniques) can help to deliver both security and privacy in the mass market. I was invited along to BBC Radio’s flagship personal finance programme, MoneyBox Live, to talk about the use of cash and the coming cashless society. I was in some pretty good company! Along with the wonderful host, Paul Lewis, were Victoria Clelland (Chief Cashier at the Bank of England and the woman whose signature is on our banknotes) and Andrew Cregan (Head of Payments Policy at the British Retail Consortium. I was very flattered to be asked, and delighted to be able to accept, to become one of the judges for the Open Up Challenge, a £2.5m prize fund backing ambitious products that will help small businesses save time and money, find better services, reduce stress and discover the intelligence in their financial data. The Open Up Challenge is run by Nesta’s Challenge Prize Centre, through Nesta’s wholly owned subsidiary Nesta Enterprises Limited. The prize is backed by the Competition & Markets Authority (CMA), with funding from eight of the UK’s largest providers of SME banking: Barclays, HSBC, Lloyds Banking Group, RBS, Santander, AIB Group (UK) p.l.c, Bank of Ireland UK and Danske Bank. The Challenge forms part of a package of CMA remedies aimed at shaking up retail banking and sits at the heart of the UK's open banking agenda. A date for your diaries: on Monday April 9th I have been invited along to the Financial Services Club in London to give a talk about the world of tokens and ICOs. 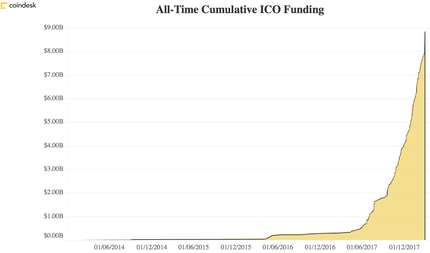 With cumulative ICO funding heading towards $9 billion (see below), it’s a good time to take a look at the phenomenon and see if there is any intellectual superstructure we can use to support token market of the future. I’ll be explaining why I don’t think this world is as mad as it seems and why the financial services industry will be exploiting a regulation token marketplace in the near future. For more information and to register for the talk, please visit The Financial Services Club.